This competition comprised two stages. The first stage was an international search for multidisciplinary design teams, based on relevant skills, past experience and an understanding of the project brief. It culminated in the selection of a shortlist of six teams who were asked to produce concept designs. The competition’s objective was to find a team who will create an outstandingly beautiful and harmonious design that integrates a sensitive restoration of the historically-significant rooms and remaining historic fabric with new flexible spaces on the upper floors for imaginative programming and events; the whole design showing an exceptional understanding of the manipulation of light, space, function and material as well as rediscovering the house’s relationship with its setting. Creation of flexible spaces that can house permanent, semi-permanent and touring exhibitions – designed to international standards. The design challenge at Clandon is complex. While the project vision outlines a ground floor restoration with new interventions at the upper levels, shortlisted competitors were reminded that the design should not be conceived purely in terms of a sandwich of layers. A key decision for designers was how to resolve the vertical circulation and present this to contemporary users. 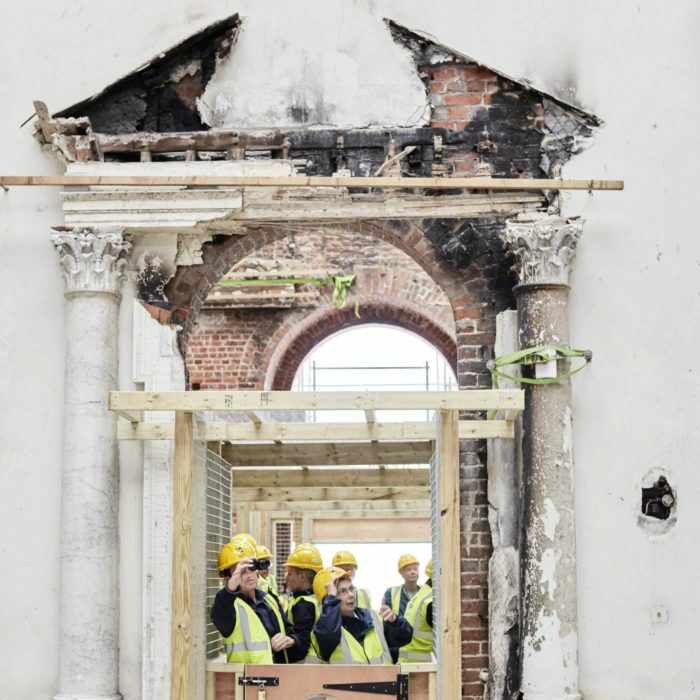 The National Trust’s intention is that the Clandon Park of the future will respond to, but not be constrained by, its pre-fire history, significance and spirit of place. The spaces to be restored on the ground floor include the principal state rooms: the Marble Hall, Saloon, Library, Speakers’ Parlour, and State Bedroom. 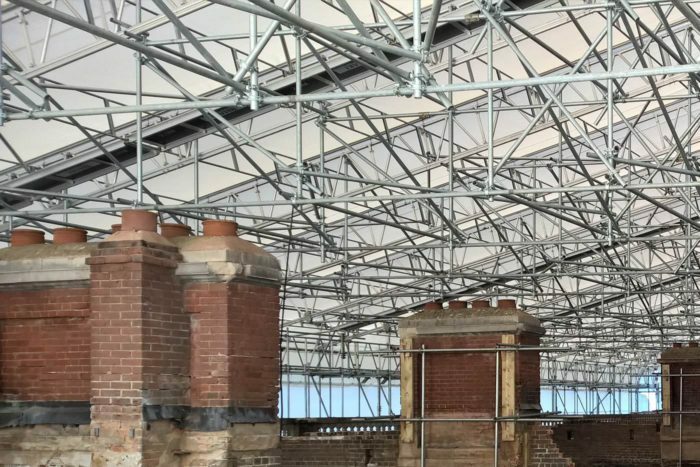 The new interventions on the first and second floors are to include: a second floor café, first floor exhibition/gallery spaces, community education/workshop/meeting spaces, staff and volunteer facilities and visitor facilities. These new gallery and visitor spaces will need to be flexible and contemporary in function, while also foregrounding craft and detail and incorporating ‘found’ heritage elements (as appropriate). 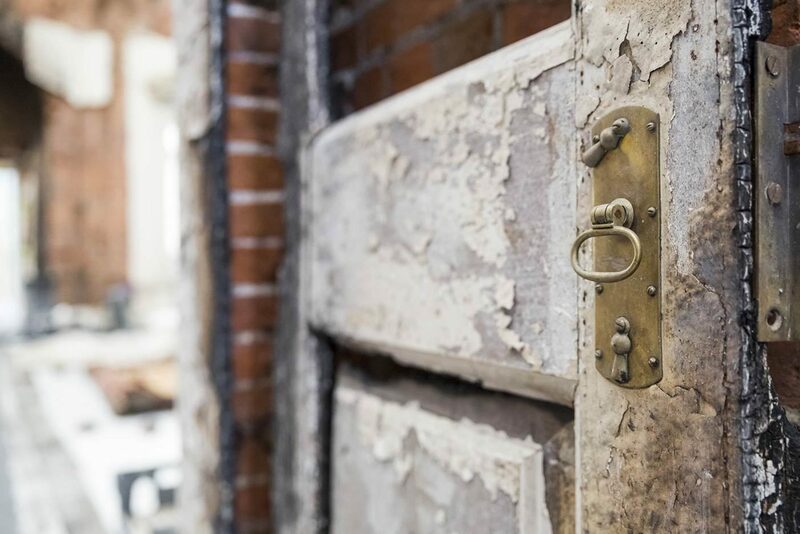 These spaces will be essential in developing new uses for Clandon and bringing new life to the house. Over the centuries, the views both from and to the house have been compromised, views to the lake within the park have been lost, and the original approach to the house has been changed. Both an appreciation of the importance of setting to the house’s original Palladian design and the appetite for audiences to look at both artefacts and the countryside, mean an improved setting will hugely benefit the house. A detailed design brief was provided to teams shortlisted for the second stage of the competition. The competition jury was chaired by Sandy Nairne CBE FSA, National Trust Board of Trustees member, and former director of the National Portrait Gallery. The full jury was announced at the competition’s second stage. The shortlist was revealed on 24 May 2017, and the six teams chosen had until mid-August to produce their concept designs. In late summer the concept designs were displayed digitally and in a public exhibition at Clandon with opportunities for public and stakeholder feedback. Subsequently, the jury met to interview the shortlist and review the designs, and Allies and Morrison was unanimously selected as the winner of the competition. Display outstanding aesthetic and material quality. Respond creatively to the emerging conservation policies and respect the historical and national significance of the building. Envision new interventions for the upper floors, which are flexible and contemporary in function, while also foregrounding craft and detail, and incorporating ‘found’ heritage elements (as appropriate). Provide a place for the community, offering a compelling and changing programme of activities that appeal across generations. Connect visitors and volunteers with Clandon’s history, personalities and stories – the heritage interpretation. Consider the visual and sensory integration of the gardens and the house, restoring the inherent qualities in the setting, ensuring landscape and building are presented as a single, integrated whole. Support a more compelling and repeatable visitor experience, including new visitor facilities, catering and retail opportunities. Provide a platform for ambitious curatorial programming, which supports social interaction and the experience of the permanent collection, and can accommodate nationally-important exhibitions and artistic initiatives. Be an exemplar for the Trust, raising Clandon’s national, regional and local profile as a visitor attraction. Resolve the challenge to integrate circulation throughout. Ensure the experience of visiting and navigating the house is equal for all. Take account of public safety, ensuring the appropriate technical, environmental and safety standards are met. Work with, not against, the remaining fabric of the building, balancing the least possible intrusion with ensuring on-going maintainability without the need for difficult or onerous access arrangements. Provide appropriate technical, environmental and security requirements to meet Government Indemnity Standards, where required. Increase income generation and visitor dwell time through new retail, catering and event facilities and opportunities. Reduce operating costs by improving the building’s operational efficiency and sustainability. 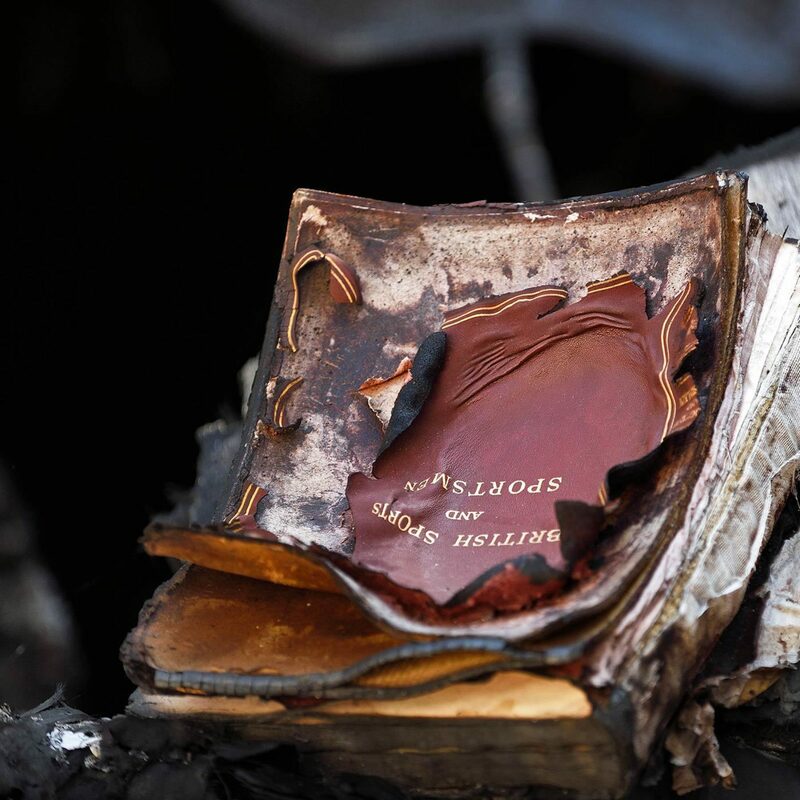 Ensure the house can provide an enjoyable environment for staff and volunteers and comfortably service increased visitor numbers, which are anticipated to be at least triple the pre-fire numbers of circa 56,000 per annum. Budget and programme: The restoration costs will be covered by the Trust’s insurance settlement. 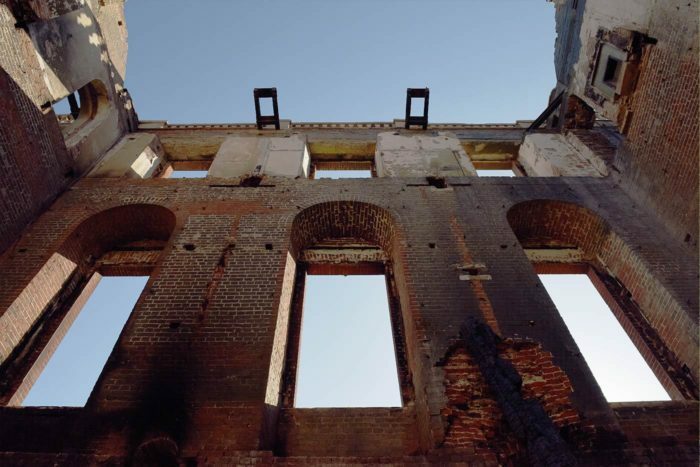 Separately, the Clandon Park Fire Appeal is already underway to raise funds for additional collection items and the gardens. The overall construction budget is estimated at £30m (excluding fees and VAT). Construction work is expected to begin in early 2019. To find out more, download the Search Statement that was issued at the competition’s first stage.